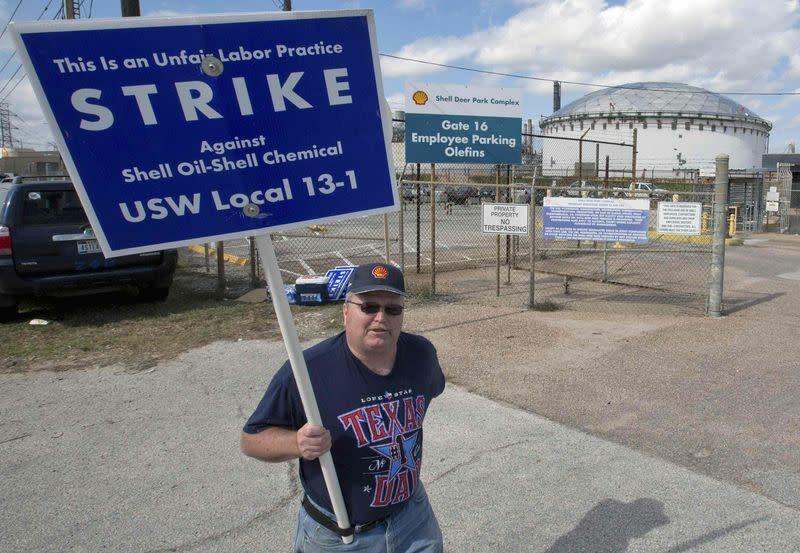 HOUSTON (Reuters) - The United Steelworkers union (USW) said little progress was made in talks with oil companies on Tuesday for a new U.S. refinery workers contract as a strike at 11 plants completed its 10th day, according to a text message issued by the union. The USW said lead oil company negotiator Royal Dutch Shell Plc failed to bring experts and information as promised when talks ended last week. A Shell spokeswoman said on Tuesday night that the firm was working "in a good faith effort to collect the requested data". In a statement posted on the union website, the USW said its negotiators engaged in a discussion with Shell's representatives "about the industry's failure to bargain in good faith and their game playing regarding our legitimate requests for information". The union then made a proposal to eliminate non-union contracts and increase staffing at refineries and chemical plants to assure safe operations, according to the USW. Shell representatives told the union more time would be needed to study the proposal and they would not agree to language that restricts owners' ability to staff their plants as they see fit, according to the USW statement. "Today, we asked questions to clarify the type of information requested and to agree on the priorities," said Shell spokeswoman Kelly op de Weegh. "We continue to discuss issues and negotiate with the USW in the hopes of coming to a mutually satisfactory agreement." The two sides have been unable to agree since talks started on Jan. 21 on the size of wage increases and how to monitor worker fatigue, which is tied to accidents and can be handled through overtime pay or adding workers. Shell's U.S. arm is the lead representative for oil companies at the negotiations for a three-year pact that would cover 30,000 workers at 63 refineries that together account for two-thirds of U.S. refining capacity. In total, strikes have been called at 11 plants, including nine refineries that account for 13 percent of U.S. refining capacity. About 5,400 workers are now on the picket lines in the first big refinery strike since 1980. Companies have called on trained managers to keep their plants running at nearly normal levels, except for Tesoro Corp, which opted to shut its Martinez, California, refinery as part of an already ongoing overhaul.